As mentioned in my previous post called the “The Compass”, I mentioned that I wanted to explore United States using only the back roads. I found the information I needed to guide me on a website called “Road Trip USA” showing the cross-country adventures on America’s two-lane Highways. So far, I have covered three of the eleven roads. While on these roads, I also used another app called Roadside America which is a travel tools and guide to unusual attractions, tourist traps, weird vacations, and road trips. So what is a roadside attraction? It’s a feature along the side of a road as a mean to attract tourists. 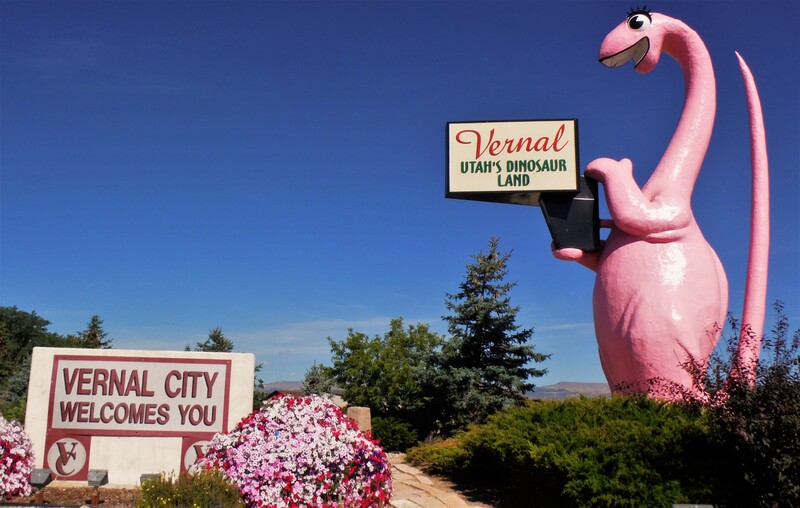 The phenomenon started in early 1930’s with entrepreneurs began building businesses in the form of common objects of enormous size such as the dinosaur next to a motel in Vernal, UT. Other attractions include monuments and pseudo-scientific amusements such as Trees of Mystery in Klamath Falls, CA. The most famous are found on Route 66 which I have not done all of it yet but it is next on my list to do. 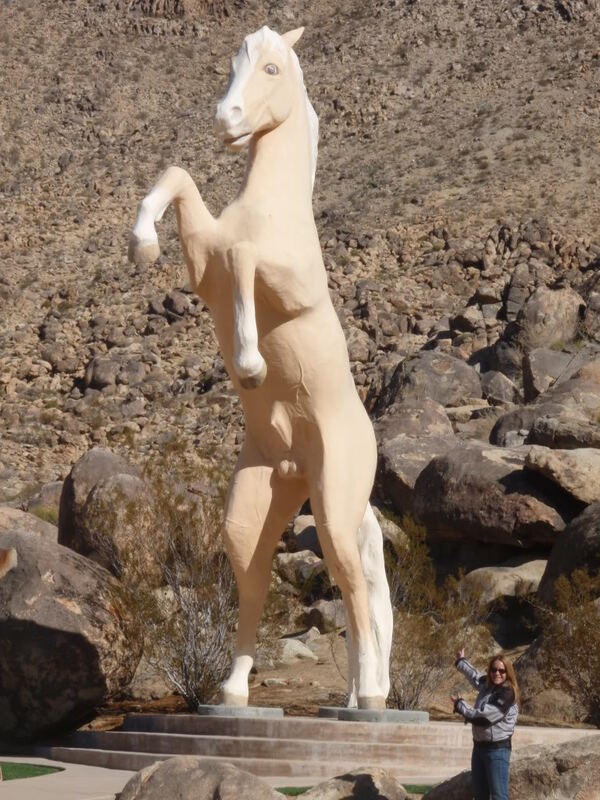 Anyhow, below are some of my favorite roadside attractions that I visited on my trip. Trigger – This 24 foot tall statue represent Trigger who was the famous horse of Roy Rogers. His horse appeared in all of his movies with him. Roy Rogers was Russ’ idol and when we went to visit the cemetery and discovered this statue, he was so excited to see an anatomically correct version of Trigger, I knew that this is the place to make Russ’ final resting place. 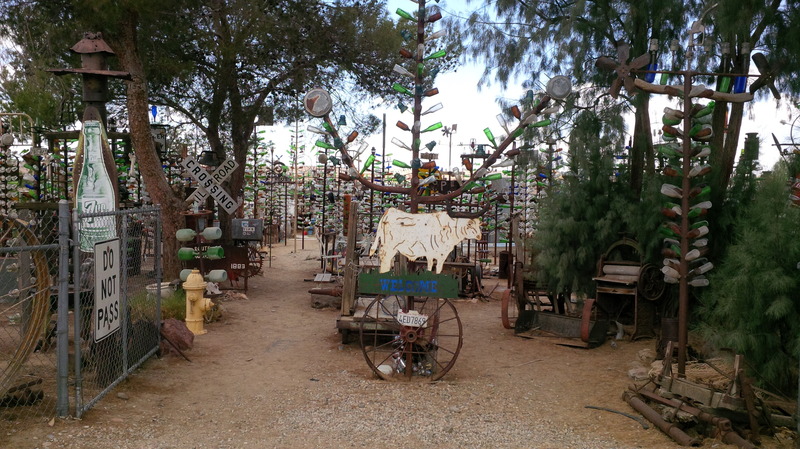 Bottle Tree Ranch – This is located near my hometown on Route 66 in Ore Grande, CA. The artist, Elmer Long began building his ranch for nearly fourteen years now. It all started when he inherited his father’s collection of bottles back in 2000. He decided to display the bottles on metal trees that he constructed. Shortly thereafter, he quit his full-time job and dedicate his life solely towards the construction and expansion of the Bottle Tree Ranch. 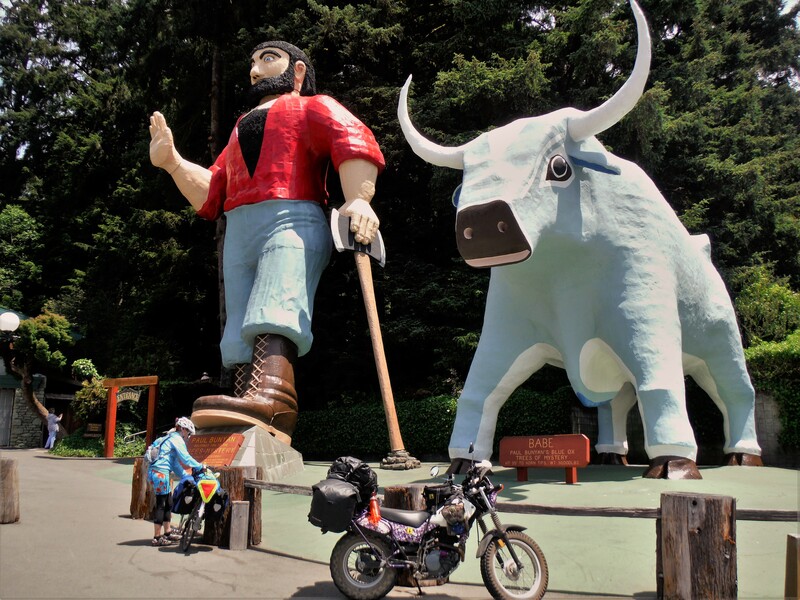 Paul Bunyan and Babe – Theses roadside attraction for the Trees of Mystery park which is famous for corkscrew trees. The statue of Paul actually talks to the visitors as they approach the entrance. Whereas the statue of Babe is not anatomically correct but it sure does one giant ball which I had to take a picture with in honor of Russ knowing that is something he would have done. 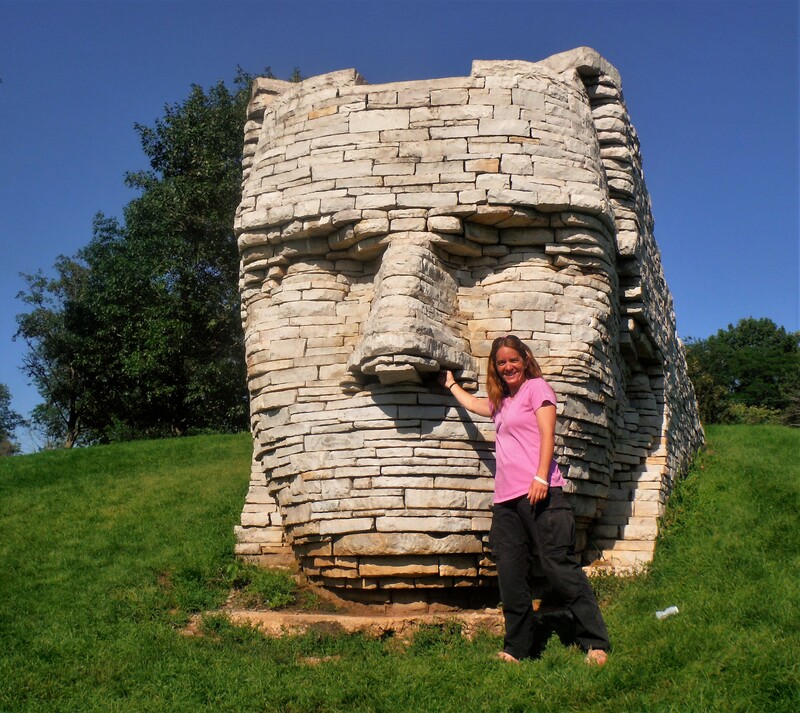 Chief Leatherlips Monument – This roadside attraction holds a special place for me since when I’m visiting friends or families I don’t take the time to visit the roadside attraction when I’m in the area. I was visiting Russ’ sister and it was her idea to make a day trip out of it. I guess the quirkiness runs in the family, like brother, like sister. Anyway, this monument is the second one that was built in honor of Chief Leatherlips further away from his death site. Since the first one was removed from the golf course and have been rumored that since it has been removed the famous PGA golf tournament has been rained on every year. 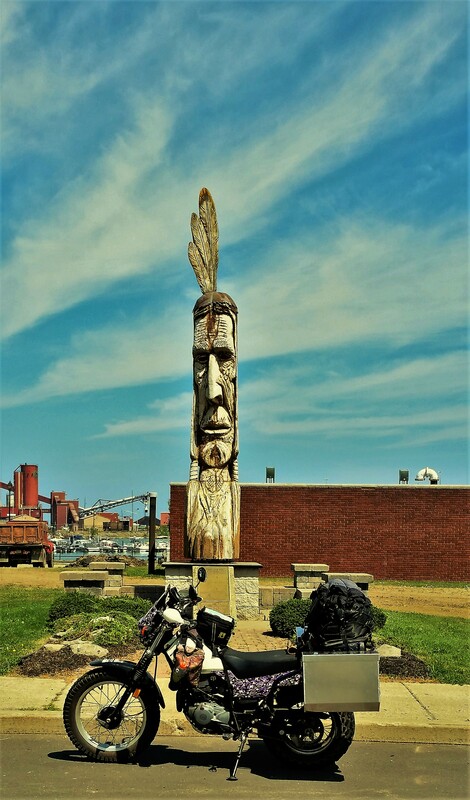 The Trail of the Whispering Giant – This one is located in Erie, PA but there are seventy-four of them in United States and Canada (at least one in each of the fifty states). These wooden statues is a collection of sculptures by a Hungarian-born artist Peter Wolf Toth. The sculptures range from fifteen to forty feet in height and all resemble the natives of the region in which they are located. The artist always donates them to the town he carved it in and never charges a fee for his time. Freedom Rock – This is a large (approx. 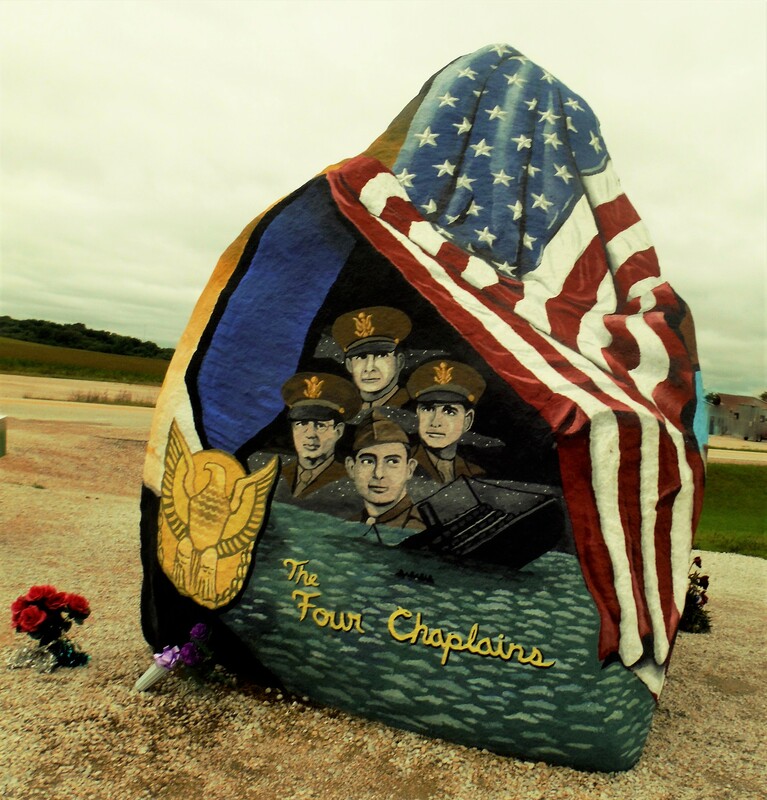 60+ ton) boulder located in a rural town of Iowa that is repainted every year in time for Memorial Day with a different Thank You theme to the U.S. Veterans for their service by artist Ray “Bubba” Sorensen. 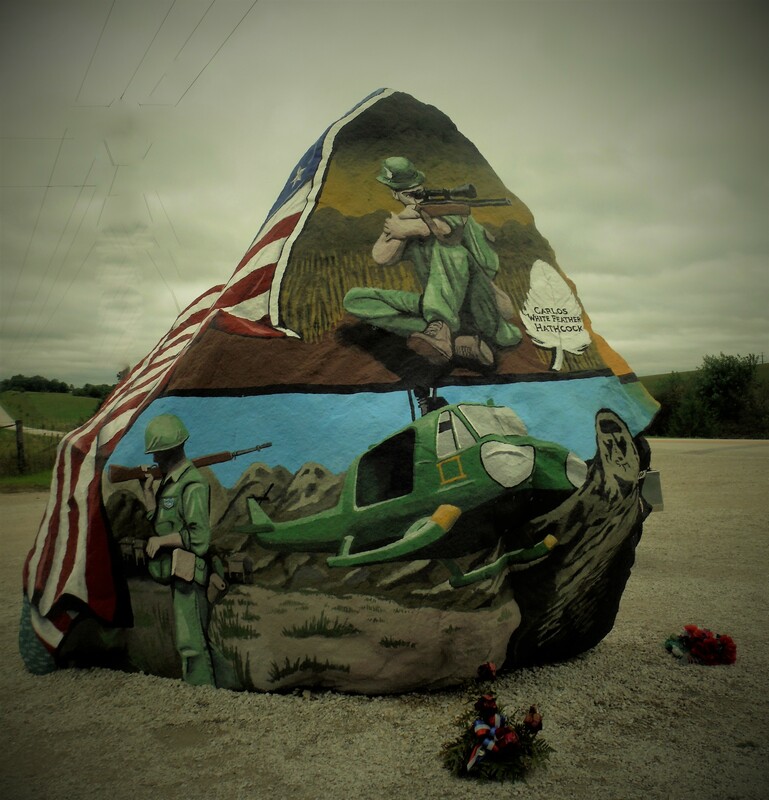 Now, he is on a mission to paint a patriotic themed rock in every county of Iowa. Wondefu l post. Love the pictures! PS I don’t know where you’re staying for your hiatus, but if you’re close. come have dinner with us. Or just hang out. I like places like these. They have personality . The pink dinosaur motel looks like it is well maintained. From the photo I get the idea that the ” FOUR CHAPLAINS ” maybe drowned during some war ? I will have to look that up . Seems interesting. I have never seen these places before. Always a joy to follow where you go, Ginamarie!